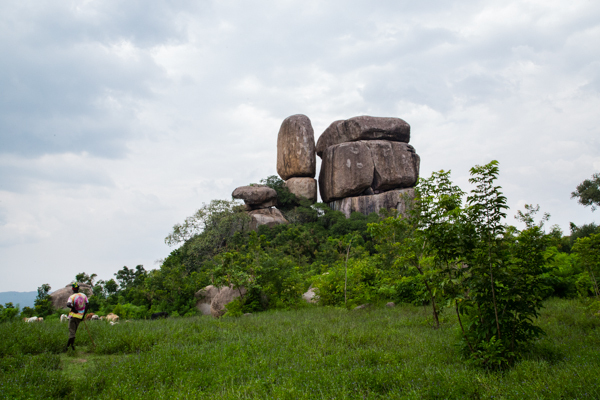 For those visiting Kisumu and the surrounding areas of Kenya, a trip to Kit Mikayi, the “Rock of the First Wife,” is not only a wonderful way to view the lush countryside from above (a bit of light rock-climbing required, no equipment necessary), but is an experience that will bring you closer to local culture, mysticism and legend. Photographer Elizabeth Mealey recently took a trip to the local landmark, capturing these images. Why is it called the “Rock of the First Wife”? The story goes that the husband in a polygamous family loved the caves so much that his first wife brought him his meals here. 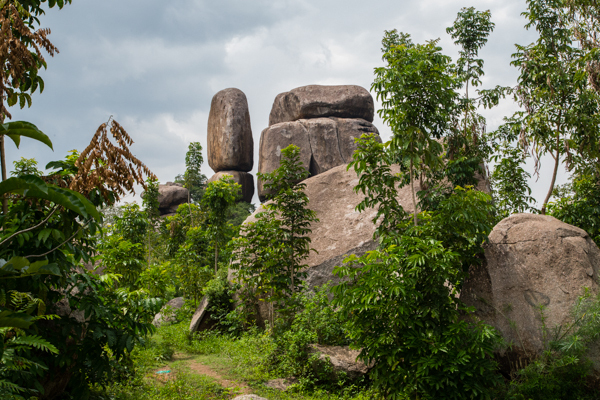 Many also believed that when she died, the first wife’s spirit inhabited this place and that the discolored streaks, which are water marks running down the rock’s face, are caused by her flowing tears. 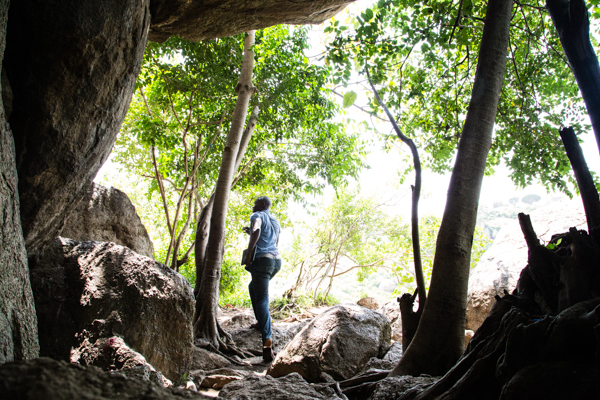 Half an hour’s drive from the city of Kisumu, Kit Mikayi may seem off the beaten track, but newly paved roads make it accessible. Hand-written signs at the visitor’s center list price of entry at 400 shillings (US$4) for a non-resident adult. 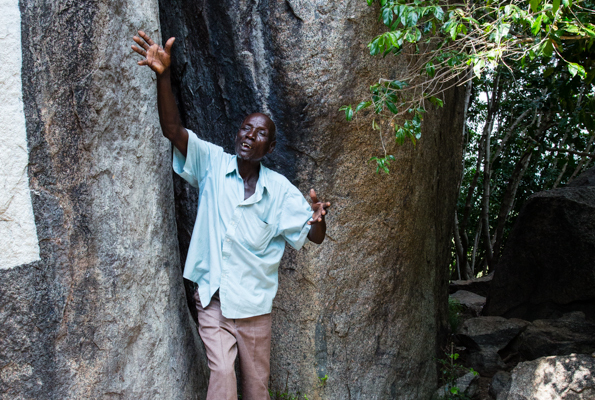 Walking up towards the rocks, our guide gives me a Luo nickname: Anyango, meaning “born in the mid-morning.” When he launches into his tour, he doesn’t just tell us the history and legend of the rock, he enacts it, demonstrating how men used to pray here for rain in days of old. 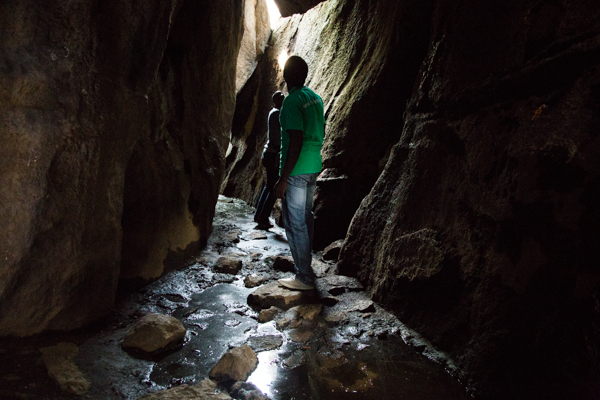 In the cool caves below, my traveling companions pause to look at bats flying overhead, cutting through slits of light. The slowly dripping water here is believed by some to have healing qualities or even holy powers. 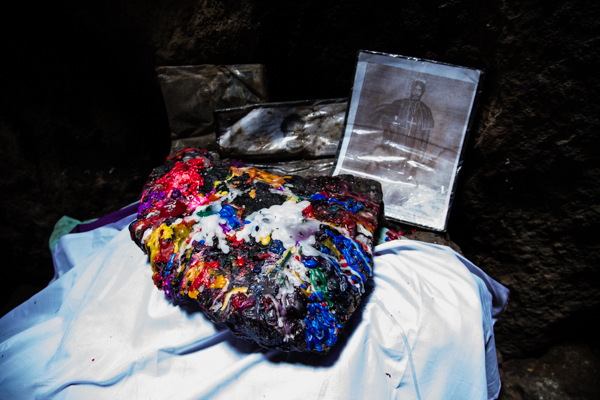 A shrine dedicated to Simeo Ondetto, evidenced by the remains of colorful wax candles, is frequently visited by the Legio Maria faithful. 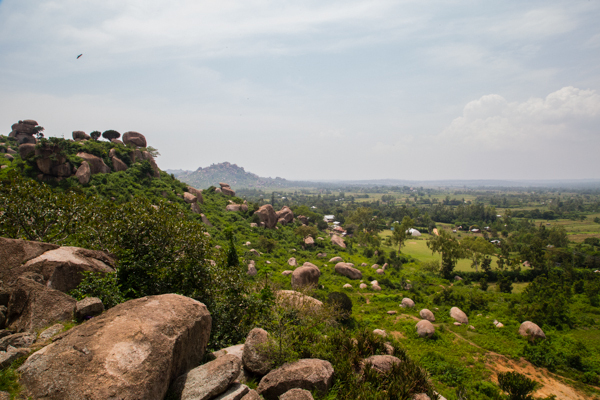 This offshoot of the Catholic church believes Ondetto to be the African reincarnation of Jesus Christ. We step out of the caves into sunshine. My companions are members of the Luo ethnic group, as are the majority of people in this region. When they were children, they sometimes walked here to play on the rocks. There was no visitor’s center then. 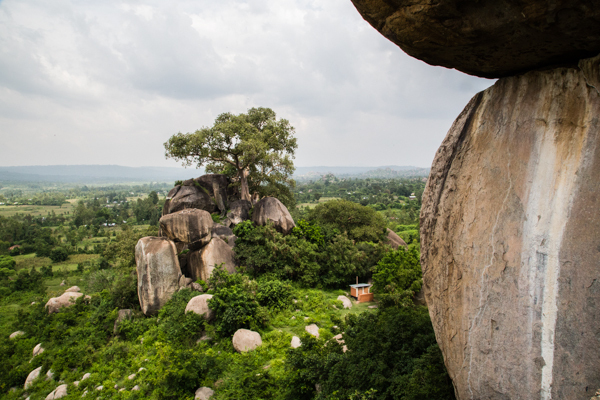 As we sit on sun-warmed rocks, our eyes rest on the Seme landscape, lush green from recent heavy rains. Rhythmic music floats up from the radio of a piki piki motorcycle taxi travelling along a dirt road in the distance. These rocks are not just pretty to look at. 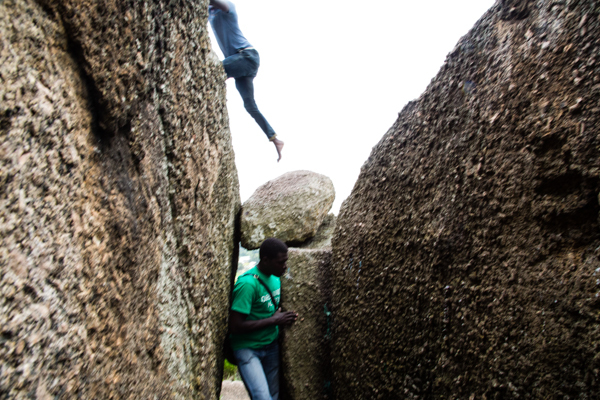 We spend several enjoyable hours clambering among them, discovering new paths and vantage points. 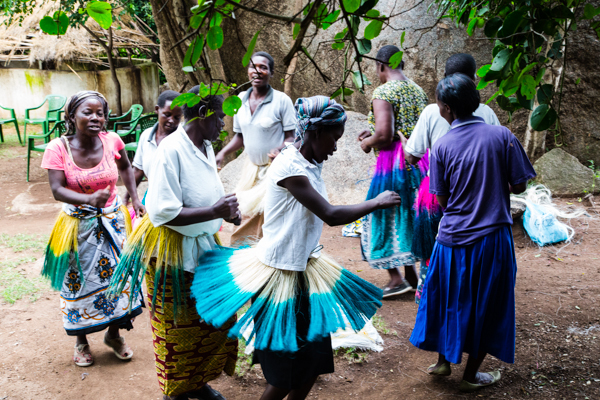 When we finally descend, a group of widows awaits us with a dance, beckoning us to join them. Inside their circle is a small four-cornered cloth for collecting donations. 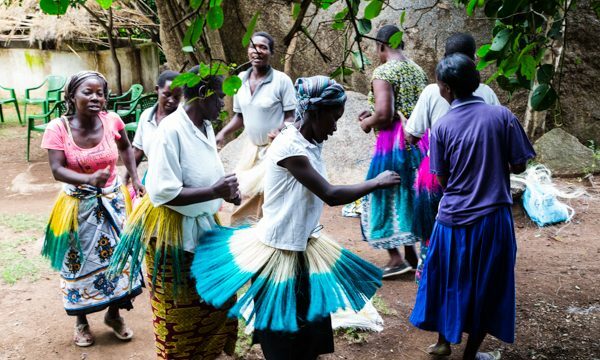 When I join, one woman ties her sisal fiber skirt around my waist. I take one last glance back as we depart. Many people say this formation of rocks, balanced in ways that seem to defy physics, symbolizes the traditional polygamous family. It is not only the physicality of this place that makes it special, but the many stories and meanings it holds. Elizabeth Mealey is a freelance photographer, filmmaker and writer currently based in Kenya. She graduated from Tufts University in May 2015 with a B.A. in Anthropology and German Studies and a minor in Film Production. In addition to her multimedia work, Elizabeth is a co-founder of the Kenyan start-up CBO, Jamii Community Village Seme, an organization that serves adults living with intellectual disabilities in Seme, Kisumu County. You can view more of her work at elizabethmealey.com.